Millers had a slightly more down-to-earth feel than the nearby Fellow. At £4 a pint, it was much more friendly on the pocket. 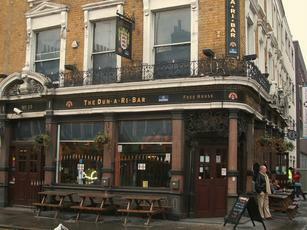 This pub was also busier, with quite a few people ordering breakfasts. The pub seems to have an Irish theme to it. Service wasn't the quickest, as the barman was making coffees and delivering breakfasts to tables. The selection was also fairly bog standard - Pride, Doom Bar & Deuchars. I had the Deuchars, which was better than expected. Now called Millers. A single bar corner location bar/pub. Three casks - guest, Pride and Directors. Modern refurbishment of bare brick and pine. Big windows. Relaxed afternoon atmosphere. OK. Spent a couple of evenings in Millers over New Year watching the football/darts and returned last Saturday lunch time for more of the same. A Good honest boozer for spending some time in to watch the sport on Tv. Bar staff more than willing with requests for whatever sport you are after.